Everyone, please welcome Heidi Heilig to Rich in Color! 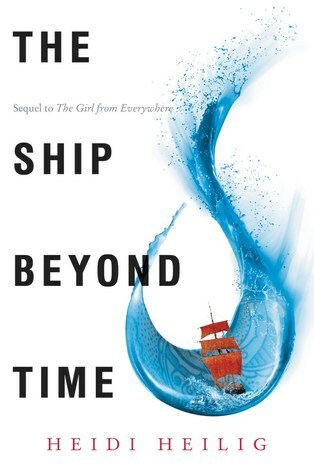 Heidi’s new book, The Ship Beyond Time is out today. We’re so excited to have Heidi to write a guest post for us–we love her Twitter account and all of the activism she does there. Desperate to change her fate, Nix takes her crew to a mythical utopia to meet another Navigator who promises to teach her how to manipulate time. But everything in this utopia is constantly changing, and nothing is what it seems—not even her relationship with Kash. Nix must grapple with whether anyone can escape her destiny, her history, her choices. Heidi Heilig weaves fantasy, history, and romance together to tackle questions of free will, fate, and what it means to love another person. But at the center of this adventure are the extraordinary, multifaceted, and multicultural characters that leap off the page, and an intricate, recognizable world that has no bounds. The sequel—and conclusion—to the indie darling The Girl from Everywhere will be devoured by fans of Rachel Hartman and Maggie Stiefvater. Now on to her post! With dumpster fires raging across America, many people understandably long to lose themselves in a good book. To be swept up in a fantasy. To forget the world around them. I wish I were one of those people. Instead, I feel unable to read or write–at least, when it comes to fiction. But my online rants continue unabated. I’m pretty sure by this point, more people know me for the content of my twitter feed than the content of my books. In a way, it makes sense. I was an activist before I was an author. Writing inclusive historical time travel was just a way to spend free time between shouting matches with libertarians. But I’m pretty sure I don’t have to tell you all about it, because I bet a lot of you are doing the same thing. Since the election gave an enormous platform to an unapologetic bigot, evil has become so very visible. Still, I’m positive that I’m preaching to the choir when I say that it’s always been there. There is always–has always been–something to protest. Something to fight. Some wrong that needs righting–and meanwhile, the novels need writing. And out there, there are people who fight all day and then, for an hour or two, need to escape into a world where someone else is fighting for a change–and even better, where the battles can be over at the end. I need to do better to honor my art as a form of activism. If you’re in the same situation, I hope you, too, will remember that writing and reading books–especially inclusive books–is a valid way to fight back. And when I forget–if you have a moment–please remind me. She holds an MFA from New York University in Musical Theatre Writing, of all things, and she’s written books and lyrics for shows including The Time Travelers Convention, Under Construction, and The Hole. 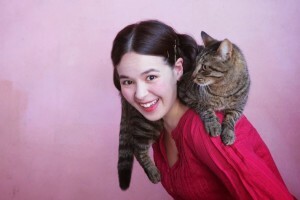 She lives in Brooklyn with her husband, her son, and their pet snake. They do not own a cat.